In mid-May, a ransomware attack known as WannaCry preyed upon thousands of systems, utilizing exploits that were leaked from the NSA earlier this year. Make sure your computer is constantly updated to avoid attacks. If you’re reading this, you are probably at risk. According to the U.S. Census, more than 75% of households in America have computers in the home, not to mention smartphones, tablets, and other internet-connected devices. Surveys report that more than 90% of consumers use the internet to locate businesses or make purchases. In a world where computers and technology are critical to societal and economic function, it’s surprising that we don’t take better care of them. 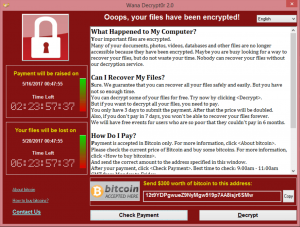 On May 12, 2017, a massive ransomware dubbed “WannaCry” attacked a plethora of individuals, companies, and government agencies. Earlier in the year, confidential information maintained by the NSA was leaked, alerting hackers to holes in the security of Windows, and allowing many un-patched issues to be exploited. The results of WannaCry were devastating. Fed-Ex was affected, and wouldn’t release details to the public. The Russian Interior Ministry reported more than 1000 computers hit. Renault (a French carmaker) had to shut down production. The National Health Service of the UK had to disrupt the operations of 61 hospitals. All of this happened in the first few hours. With one quick search, you can find news articles of millions of dollars of loss, or videos of people whose heart surgeries were canceled. But besides Fed-Ex, it seems like the US wasn’t affected very much. And maybe your package was getting shipped through UPS, or you weren’t scheduled for surgery in the UK, so you didn’t feel the effects at all. Unfortunately, the attacks aren’t over yet. And big corporations aren’t the only ones at risk. According to a poll by Citrix, more than 90% of hospitals still had at least some systems running Windows XP (for those of us who forgot about that, it was released in 2001. Yikes). If you still are, you’ve probably been ignoring the security box popping up saying you have features out of date for a while now. Maybe that’s what Fed-Ex did. The most common way that someone gets hacked is because they don’t continuously update their software. When new software becomes available, its usually available to new users as a free update or a purchasable upgrade. When you do update, you can easily discover what changes were made to the old software. In other words, they spell out the problems the old software had. If you don’t update to the new version, you now have software with published issues, loopholes, or defects. Hackers can easily take advantage of these defects, and, if they find the right one, can break into your system, bypass your cyber security, and inject ransomware, which basically encrypts your data, and forces you to pay the hacker to release the un-encryption code or risk losing your data. And since Microsoft Windows is the most common operating system in the world by far (1.5 billion users), it’s more than likely that your computer, or website, or app, needs updating, and thousands of hackers now have an easy way to break into your computer or server. For cyber security protection that can beat WannaCry Ransomware, and keep your data safe from billions of other threats, click here, and get a free vulnerability scan.